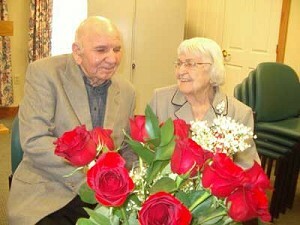 Willis and Iola Hinkle have been married for 77 years. 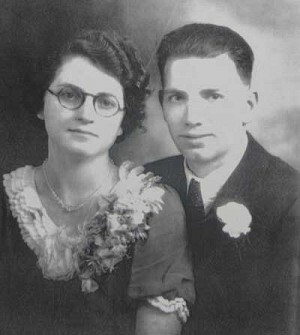 Willis and Iola Hinkle on their wedding day. CORVALLIS — Each year, Worldwide Marriage Encounter recognizes one couple from each state that has been married the longest. This year that honor goes to Willis and Iola Hinkle, married 77 years ago on July 3, 1935, in Mount Angel. Now, they live at the Providence Benedictine Orchard House Living Center in Mount Angel. In conjunction with World Marriage Day on Feb. 10, St. Mary Parish offered several opportunities to enrich and celebrate the sacrament of matrimony. On Feb. 2, 30 couples attended a marriage enrichment session, “Married and in Love — Most of the Time.” Couples were given the opportunity to reflect on their own relationships and share with other couples. Presenters were Tom and Kathy Dauer from Spokane, as well as four couples from the Oregon Anglo and Hispanic Worldwide Marriage Encounter communities. On Feb. 9, the parish hosted a dinner for married couples. Those who attended were treated to salmon in the upper social hall. During Feb. 10 Masses, World Marriage Day was celebrated with a display of wedding pictures of couples married 10 years or fewer. Last year a similar display had pictures of couples married 50 years or more. When numbers were tallied, the years married added up to 2,237.